Symphony No.104 in D major "London"
Hidemi Suzuki graduated from Toho Gakuen School of Music in Tokyo, studied violoncello and conducting technique under Prof. Yoritoyo Inoue, Tadaaki Odaka and others. Won some prizes in Japan. In 1984, Mr. Suzuki went to the Netherlands to study under Anner Bijlsma at the Royal Conservatory. 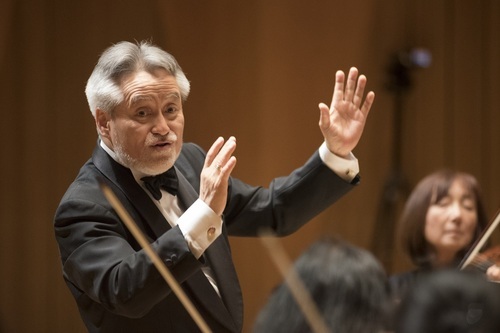 He won first prize at the 1st International Baroque Cello Competition in Paris in 1986, was a member of the Orchestra of the 18th Century from 1985 to 1993, a principal member of La Petite Bande from 1992 to 2001, and has been first cellist of Bach Collegium Japan since its founding. He was professor of the baroque cello course of the Brussels Royal Conservatory from 1994 to 2000, and now teaches at Tokyo National University of Fine Arts and Music. In 1995, Mr. Suzuki became the first Japanese cellist to record Bach’s six suites for violoncello solo release on a period instrument; it was awarded an Artistic Creation Prize by the Agency for Cultural Affairs that year. His recording of Beethoven’s early works got Diapason d’Or in France, and recording of Haydn’s concerti with La Petite Bande got the Record Academy award in Japan. In 2001, Mr. Suzuki founded “Orchestra Libera Classica” to focus on classical repertoire, especially Joseph Haydn; their performances and live recordings on TDK-core’s Arte dell’ arco label have been critically and popularly acclaimed. He has also written a book, “Kogakki” yo, Saraba! (which means, “Farewell, ‘Ancient Instruments’ !”).